Today I talk about some soft covers and hard shells; on Wednesday, I’ll cover a few leather jackets and rigid cases. 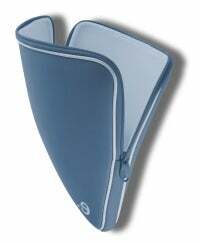 Back when I had a PowerBook Duo, neoprene “skin” sleeves were quite popular. They protected laptops against scratches and scuffs—although not against anything worse than a minor bump—and some even let you use your laptop without removing the sleeve. Nowadays, most laptops run too hot to be used in a sleeve; on the other hand, today’s sleeves are quite a bit more rugged, made of materials that offer decent shock protection, as well. The various LArobes are also among the most attractive and protective soft sleeves I’ve seen, thanks to a wide range of available colors, stylish trim, and impressive attention to detail. For example, the zipper is color matched, and the zipper pulls are wide and easy to grab. On the inside of the sleeve, each seam serves dual duty as a thick, padded lip that offers additional shock protection for the edges of your laptop (as well as a bumper between your laptop and the sleeve’s zipper). Unlike the other two sleeves below, the LArobe is truly a sleeve : when unzipped, only the top third or so of your laptop is exposed to allow you to slide the computer in and out of the case. The LArobe doesn’t fit like a snug glove; there’s a bit of room—half an inch or so, vertically and horizontally—for your laptop to move around inside. But I was impressed by the LArobe, both aesthetically and functionally. If you just need mild protection when sticking your laptop inside another bag, this is a good bet. Still, if you’re not interested in the stylish colors of the LArobe, and you’re OK with slightly less shock protection, the BookCase and BookCase Pro are anywhere from $5 to $15 less expensive and are still solid sleeves. Although it sounds convenient, there are three drawbacks to this approach. The first is that, given how hot today’s notebooks get, surrounding them in a sleeve while they’re in use certainly won’t help with heat dissipation. The second is that on laptops with a front-ejecting optical drive, the elastic straps actually block the drive; you’ll need to unfasten the front-right corner of the sleeve in order to use the drive. Finally, I wasn’t able to get a MacBook Pro or a MacBook to close properly with these elastic straps in place. Thanks to those issues, I recommend using the Skinbook as a standard sleeve; but if you’re going to do that, I found the LArobe and BookCase sleeves to be more attractive, more protective, and better-fitting for the same or lower prices. A couple vendors have released snap-on polycarbonate shells that protect your laptop from scratches; some are clear, whereas others let you “change” the color of your computer. Having used one of these shells on my own laptop since last fall, I can tell you that they work well, although there are two potential risks. The first is that you need to be sure to clean your laptop and the interior of the shell before putting on the shell, and you should periodically remove the shell and brush out any dust and dirt that finds its way underneath. If you don’t, that debris can actually scratch your laptop; in fact, because it’s pressed between your laptop and the shell, it can do more damage that if the shell wasn’t on. Second, be careful not to open your laptop screen too forcefully. The top piece of these shells clips onto your laptop’s screen and effectively makes it thicker; when you open the screen fully, the base of the screen is therefore coming into contact with the bottom of the laptop sooner than normal and putting additional pressure on the screen’s hinge. I haven’t seen any actual damage due to this design—again, common to every shell I’ve seen—but it does make me nervous. There are two difference between the original 15-inch SeeThru and the current one: Apple made slight changes to the arrangement of ports on the MacBook Pro between the original 15-inch model and subsequent versions; to accommodate both layouts, the right-hand side of the 15-inch SeeThru uses a long, single opening rather than a separate opening for each port. In addition, Speck has raised the price of the 15-inch SeeThru to $50 to match the rest of the line. On the other hand, the BookShell offers less overall protection: the aforementioned openings on the bottom are quite large; the entire back edge of the MacBook is unprotected (compared to just the hinge area with the SeeThru); and instead of individual openings for each port and the optical drive, the BookShell leaves most of the right and left sides open. Whether this is a good tradeoff to save $15 is up to you.